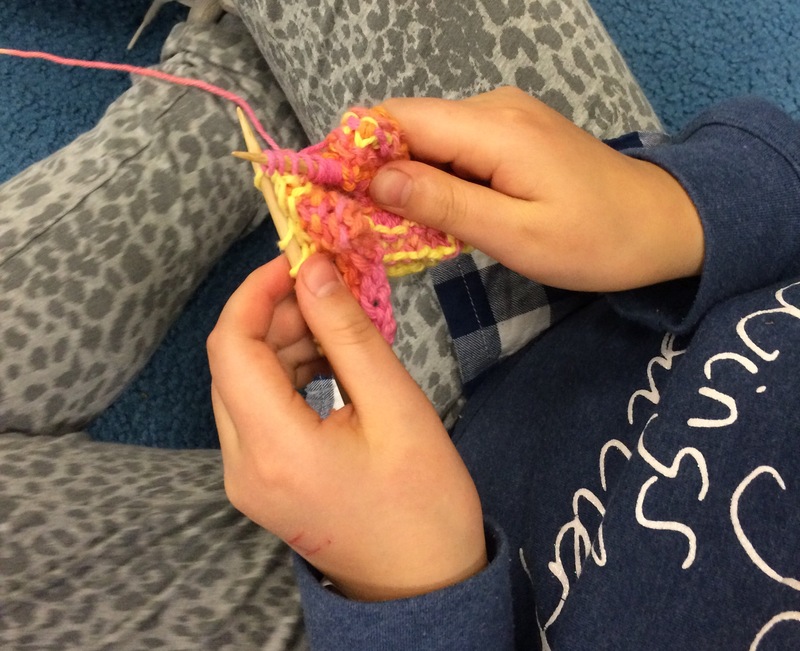 For the past few weeks, I’ve been spending Monday afternoons teaching knitting to eight girls at a local after-school program. It’s the most high-energy 90 minutes of my week! As always when I teach new knitters, a first lesson is to spot and then fix mistakes. Mistakes are inevitable, and if you can’t fix them, you’re more likely to give up. 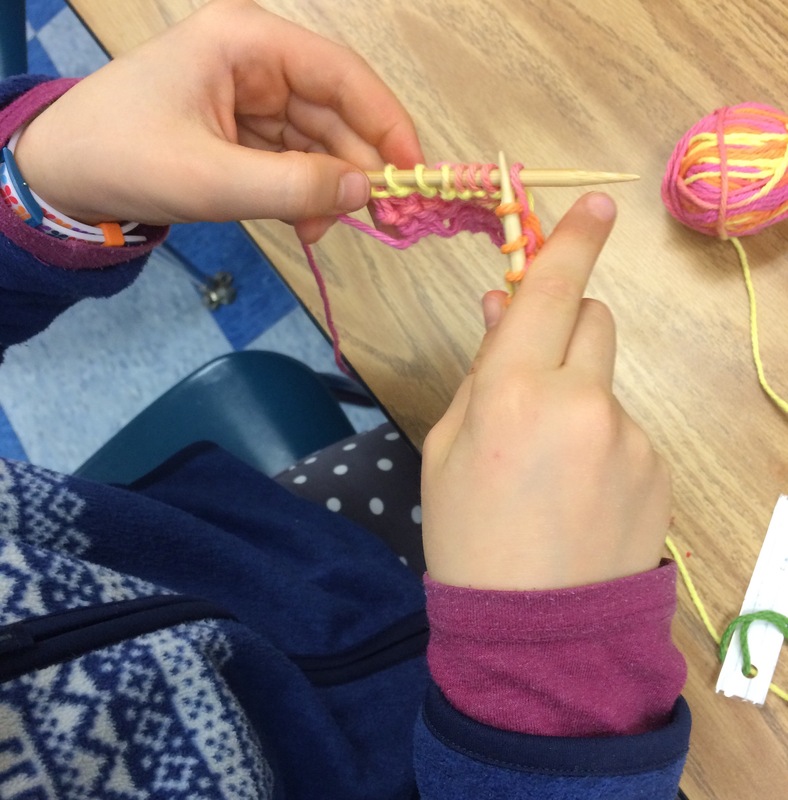 Although only a couple of the girls have tried knitting before, each of the 7 fourth graders and one fifth grader is on her way to becoming a Fearless Knitter. They’ve started with a cotton dishcloth, casting on (knitted cast-on) about 33 stitches, and working a few inches in garter stitch. I like seeing how each of them holds the needles and yarn, developing her own technique and muscle memory for the craft. 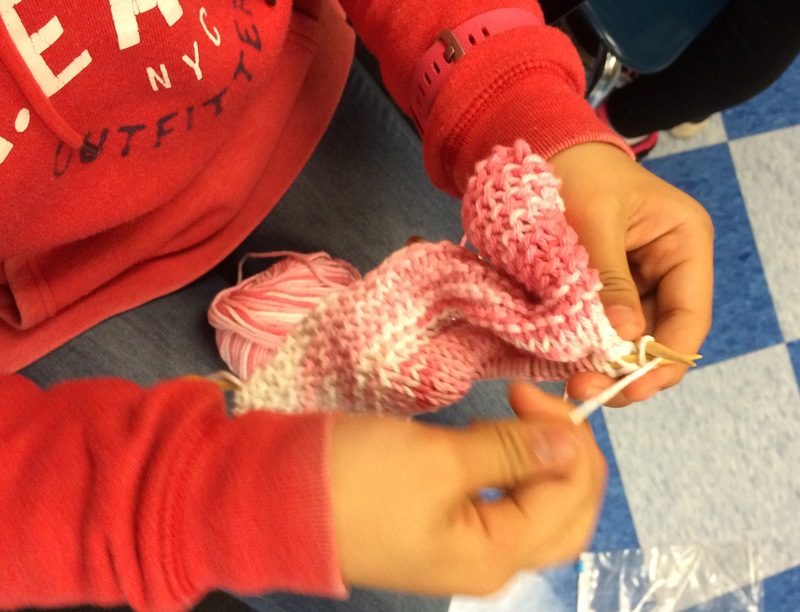 With each stitch, they’re becoming more competent and more confident. 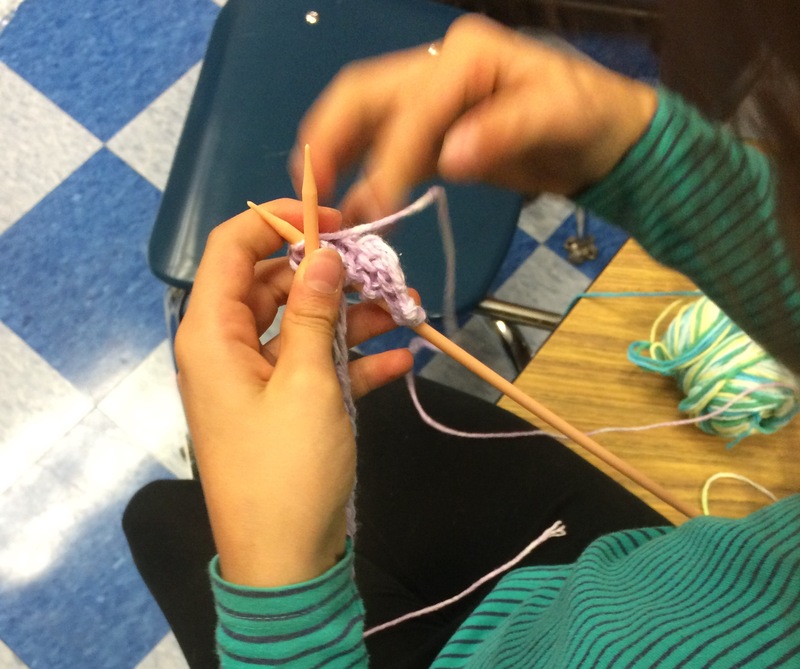 “When I woke up this morning, I dreaded going to school, but then I remembered that we’d be knitting this afternoon. 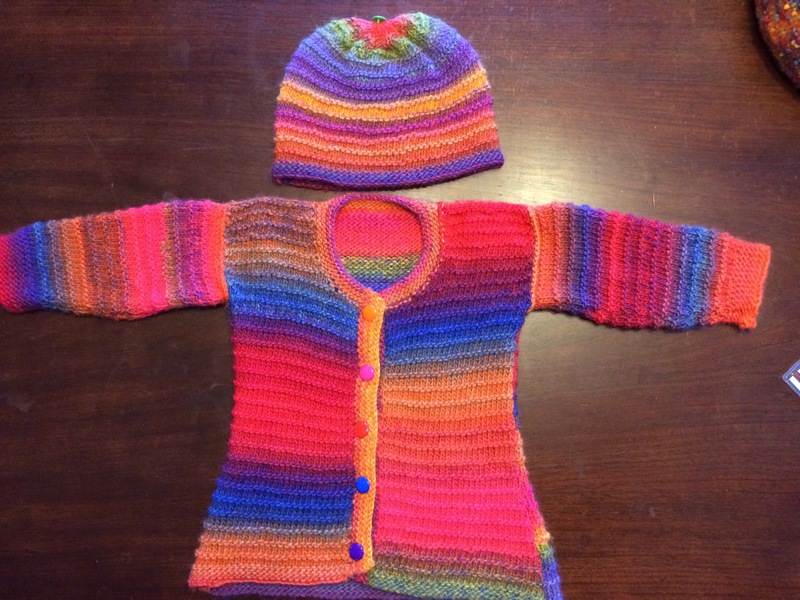 That gave me energy to make it through the whole school day!” A bit dramatic perhaps, but a sentiment that many knitters — including me — share. There are times when a quick, basic project is needed. That time for me usually involves the completion of one project and some indecision on what to make next. 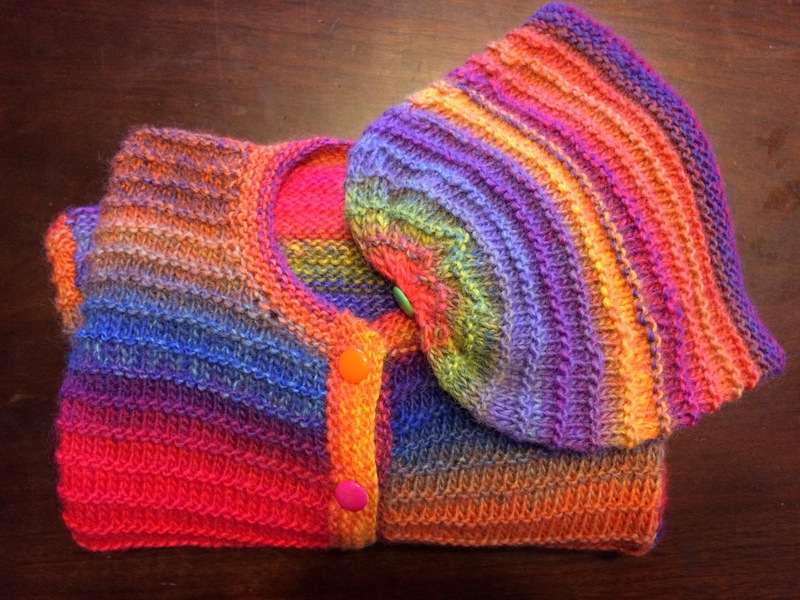 My go-to “palette cleanser” projects are baby hats and cotton dishcloths or washcloths (depending on the size). Last week it was a dishcloth. 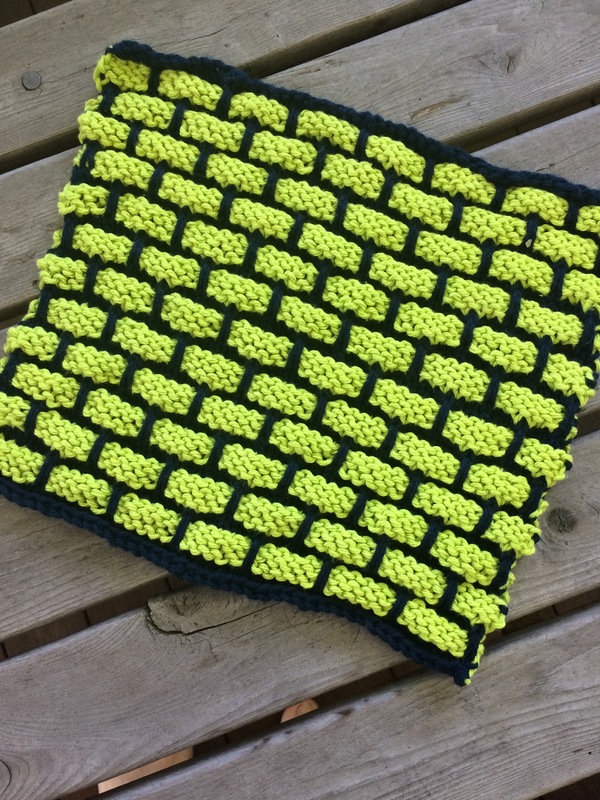 Not just any dishcloth though; Mason Dixon Knitting’s Ballband Dishcloth, a simple, clever, and quick design. Lily Sugar’n Cream in Indigo and Hot Green (although I think of it as Green Apple). Even though I’ve started a new project (stay tuned for next post or get a sneak preview on Twitter @SaltwtrHillKnit), I’ve started a smaller version, which will be a wash cloth for a lovely niece who’s heading off to two weeks of overnight camp. What’s your go-to quick-and-easy knitting project? 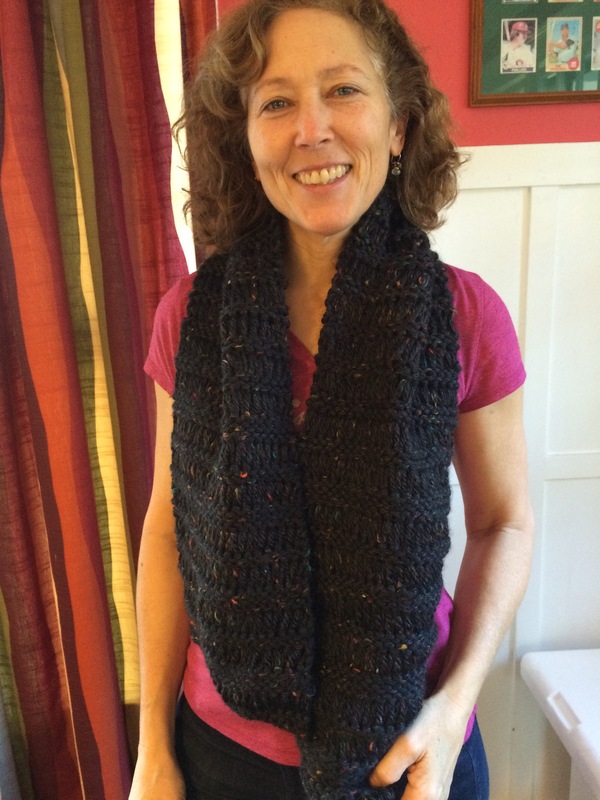 I’ve said before how much I enjoy teaching knitting, and my current class is no exception. Once a week, these six intrepid women gather around the table, needles in hand, patterns laid out and personally annotated, and they dive into their projects. Chatting, whispered counting (34, 35 — damn, I’m supposed to have 36! ), an occasional curse, and laughter abound. Everyone gives a little update and has a question or two about how to proceed (dropped or added stitches are common). 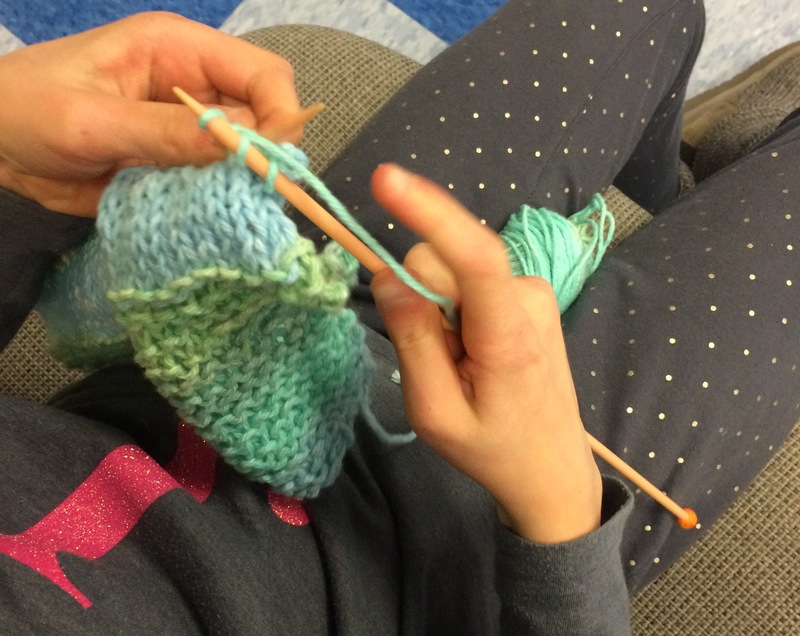 We break after about a half hour for a brief lesson — how to join yarn, how to bind off, different ways to cast on, common pattern abbreviations — and then it’s back to the individual projects. 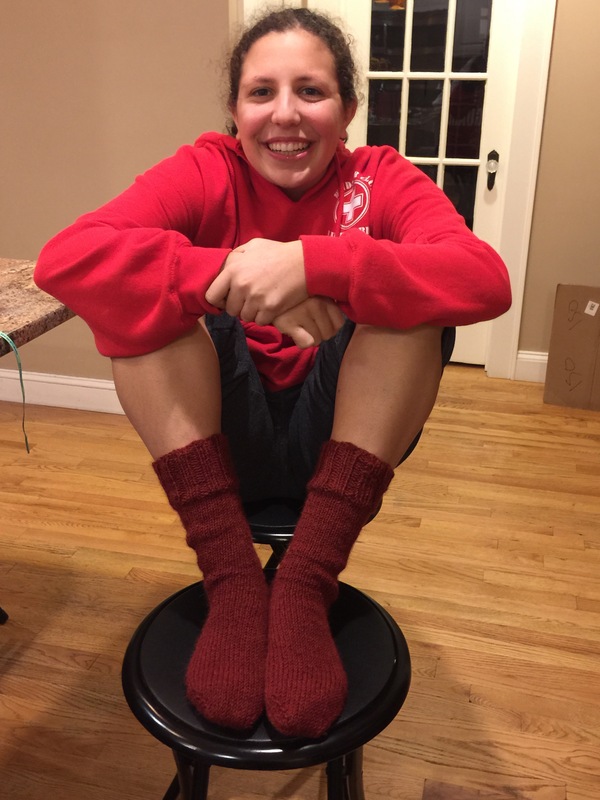 Rachel announced that her tween daughter turned up her nose at the North Face knock-off hat — with cables! — that her mother had created. We admired the hat and commiserated over the fickle fashion tastes of children. 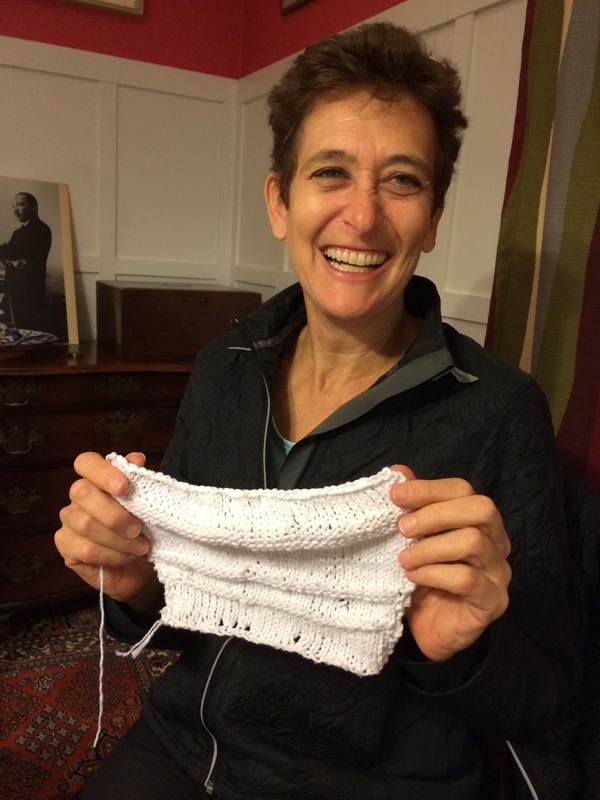 She’s also working on a luscious infinity scarf for the same daughter. If she doesn’t like this one, I’d invoke the “two strikes and you’re out” rule. Although, given my soft heart and love of knitting, I probably wouldn’t implement said “rule.” I don’t know what yarn she’s using. I’ll check and let you know. The highlight of the past week, at least for me, was Erin’s first finished project — a small cotton washcloth (or dishcloth) in a variety of stitches: garter, stockinette, seed. 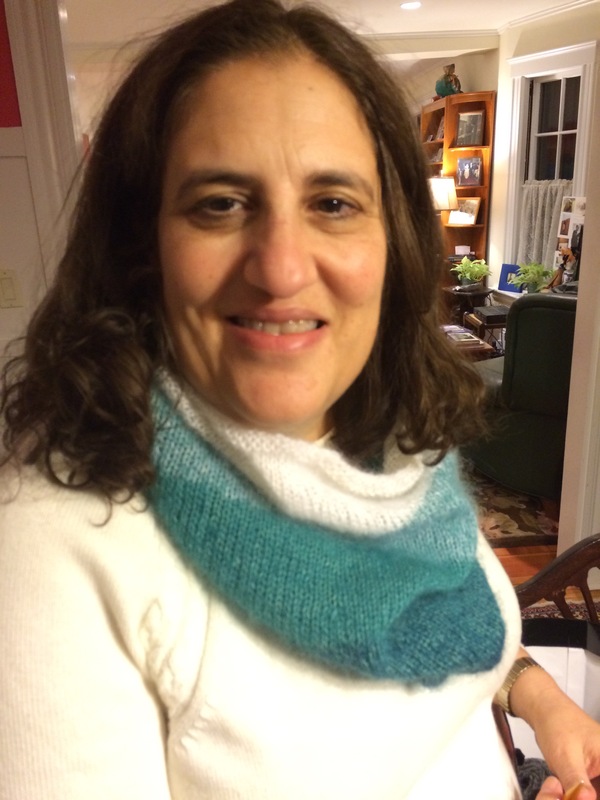 She cast on, tinked back to correct errors, switched stitches every once in a while, learned that starting or ending with garter stitch will keep the edge from rolling, and bound off. She’s justifiably proud, don’t you agree?